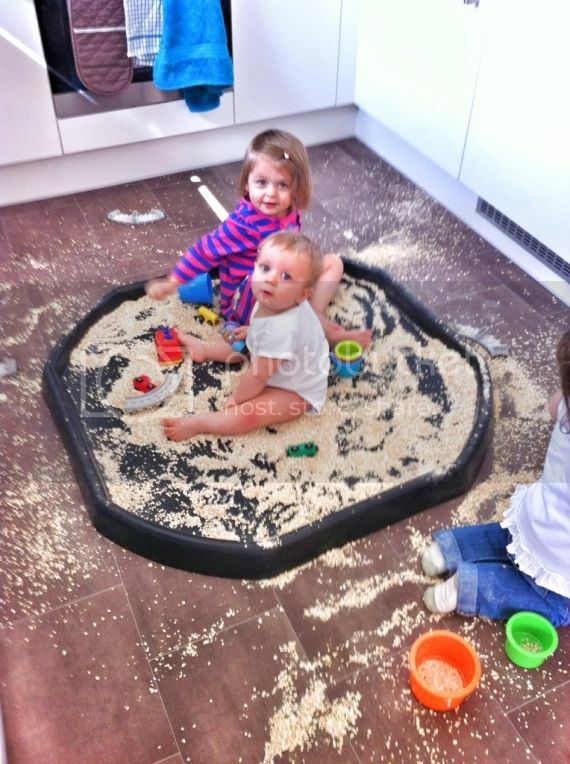 The other day my friend came by with her little girl, so I decided to use our Tuff Spot to set up some playtime fun. I had bought a bag of value porridge oats a while ago so I dragged it from the back of the cupboard and opened the packet out onto the Tuff Spot. And it was that simple - I added a few cups, spoons and trains to interact with and left them to it. Baby J of course, had no reservations about getting stuck in. I stripped him down to his vest and let him crawl about. He generally snacked on them, whilst H enjoyed spooning them all over his head! H stayed around the outside of the Tuff Spot - she's not quite gained her confidence to get completely messy as yet. She likes pouring and sorting so the cups and bowls were her toys of choice and quickly her 'sorting' resulted in my kitchen floor becoming a pool of oats! My friends little girl took a more laid back approach of wandering around the edge, having a little play, then marching off to play with H's toy kitchen at the other side of the room. 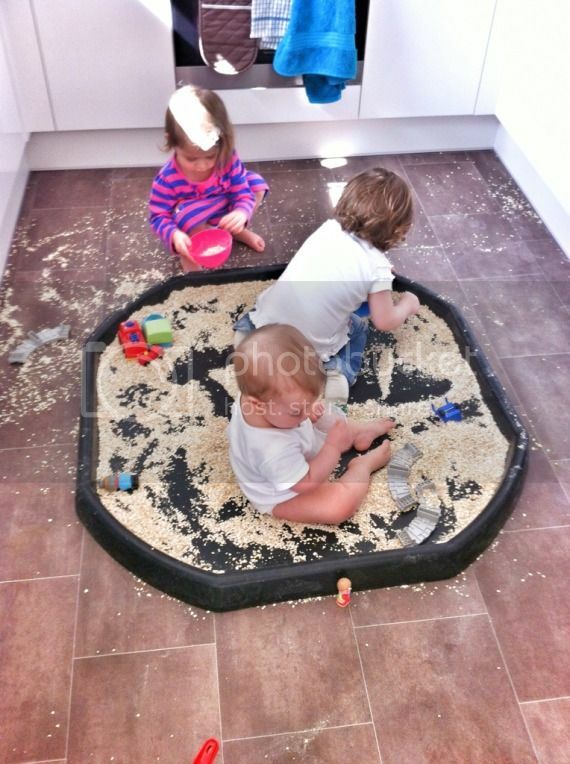 The children played for about half an hour and at the end of it all I simply dusted them off and swept all the oats up. 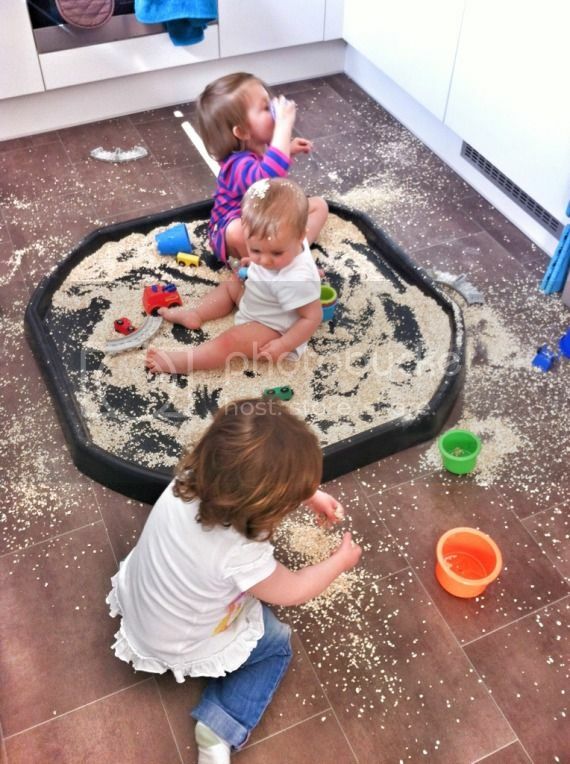 It was a great little activity that anyone can do to amuse the children for a while and introduce messy play to them and yourself!